You are just buying a truffle. It’s a fragile good you must use quickly. If you plane to eat it during the week : As soon as you are at home, wash and brush your truffle carefully under water with a a little bit strong nail brush. Any piece of soil must stick to the truffle. Dry it carefully. 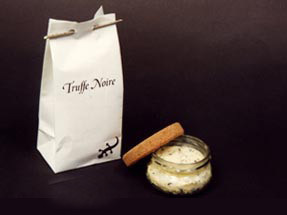 Put it in a hermetically closed glass jar with the fat you will use to your recipe : buter, fresh cream, oil (evoid olive oil, acides eat away the truffle). Keep it to the frig. At your diner day, take it out and prepare your dish. If you would like to keep your truffle longer, here is the best way to keep its flavours : As explained above, wash, brush and dry it carefully. Make few butter melt in a little casserole. Roll your truffle in this melt, but not hot, butter. Refresh it completly. Pack your truffle in an aluminium paper and put it in the high cold freezer. The day of your diner, grate or cut your truffle still frozen in your dish. The defrosting water (don’t throw it out !) and the covered butter will spread all its flavours in your dish.